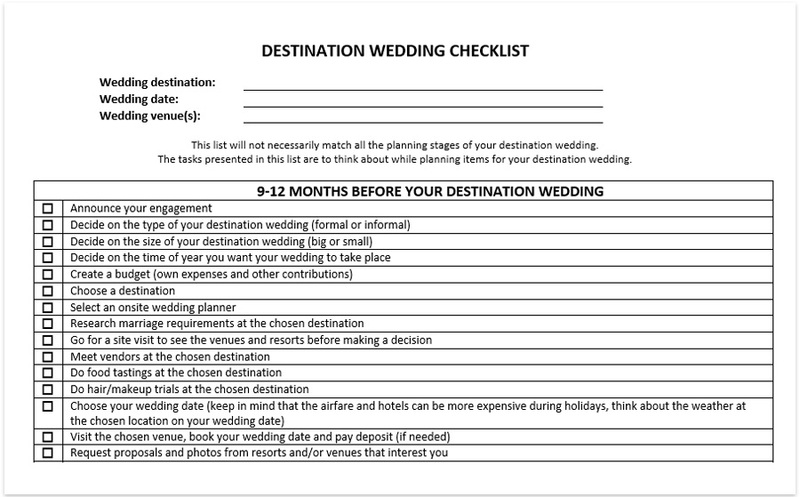 Destination wedding checklist is important when you are planning your wedding abroad and need long-distance decision making. Planning a destination wedding checklist is associated with to-do lists, tasks, emails and telephone calls with the venue representatives during the planning process. Destination wedding checklist will help you to stay organised and plan the main tasks and arrangements for your big day, even if your event venue is located in another country. We all know that destination weddings are beautiful. Destination weddings are the perfect opportunity for your guests to leave their hometowns and get new impressions and experiences not just from the wedding, but also from new places, cities or even countries. Think about your budget. Remember, your destination wedding expenses differ from those in your hometown. Here you will need to think about the airfare, accommodation for you and your guests, additional expenses for the transfers and certain details of your wedding organisation. Usually, the couples planning a wedding in a certain country, check the weather conditions in the destination area for the time of their wedding in advance. The couples make sure they don?t need a visa (or they apply for a visa if needed) and have several wedding reception venues in mind. Destination wedding checklist includes organization of a marriage license while planning an event abroad. The wedding regulations differ from country to country, so make sure you have arranged all your documents, and you know every detail of getting married abroad. A good idea here is to hire a local (available at your wedding destination) wedding planner, who knows the location, local wedding vendors, who speaks your language and who can help you with the main issues at the wedding destination. Also, planning a destination wedding checklist advises you to get your wedding insurance. Discuss these questions with the venue and clarify the conditions of the liability and cancellation insurance. In case you already know, at what venue your wedding will take place, make sure you have booked it for your wedding date. You can use an event venue contract template, add all the important details to your event venue contract before signing it. You will probably need to pay a deposit to book your venue. You also need to think carefully not only about the documents which you may need for your destination wedding, but also about the vaccines and special medical treatment which is recommended for visiting the location. You will definitely stay more than one day at your wedding destination venue, so make sure you have booked your honeymoon suite where you will stay after the end of your wedding day. Having 6-11 months before your wedding day, prepare RSVPs and send them out. For local weddings, sending and receiving back the RSVPs takes less time, than for the wedding which you are planning in another country. The planning a destination wedding checklist also includes organisation of transportation and accommodation for the guests. Advise your guests, who have confirmed the attendance, to organise all the documents (including visas) for the travelling to your wedding destination. 6-11 months before your wedding, you can create your wedding website, provide all the necessary information on travelling and accommodation, including maps, advises, weather information, dress-code, etc. The wedding website information also usually includes registry details. However the destination wedding practice shows, that every couple who is getting married understands that travelling to another country to attend a wedding costs a certain amount of money, so the registry section on the website often includes the note that ?your presence is the best gift?. 6-11 months is also the time when the first contacts with vendors are made. There are cases when the couple wants to hire a vendor from their hometown to work at their wedding destination. That means that the transportation and accommodation for these vendors need to be organised in advance. Make sure that you have your airline tickets, that your accommodation is booked and that all your documents (and visas, if needed) are in order. 6-11 months before your wedding is the time when the wedding attire and the rings of the bride and groom are prepared; the honeymoon is planned and booked; the wedding vows are getting prepared. 6-8 months before the wedding, the engagement photos are taken. The rehearsal dinner, the menus and the entertainment for the rehearsal dinner are organised. The couple needs to think carefully who is going to attend the rehearsal dinner. That means, how many people need transportation to the wedding destination and accommodation for a period before the wedding. 6-8 months before the wedding is also the time, when the vendors are booked. Now you can discuss the wedding menus with the caterers, hire photographers and videographers, discuss your wedding ceremony details with the officiant, book live bands for the reception and musicians for the ceremony; entertainers, rental and supplies companies, makeup and beauty artists, cake companies, floral design professional, transportation companies at the location where the wedding will take place. In case of a destination wedding, the client is not able to have menu tastings onsite. That?s why hiring a local wedding planner at the wedding destination is a good idea. The planner will make sure the caterer?s menus correspond to client?s preferences and expectations. Another task of your destination wedding checklist is finding out the final number of the guests. Here you can use RSVPs, where you can ask your guests to indicate the menu choices, number of kids menus and dietary requirements. This simplifies a lot the work with the caterers in case of destination weddings. Finding out the number of guests and the guests? meal preferences usually takes place 3-5 months before the wedding. Having 6-8 weeks before the wedding, the client provides a shot list for the photographer and the video checklist for the videographer, discusses the final concepts of decorations, flower design and use of rental and supplies; draws up the time for the setup and deliveries; creates a song list for the ceremony and reception. Having 3-5 weeks before the wedding, make sure the gift bags (gifts and favours for the guests and the kids) are organized, all paper goods (table numbers, place cards, invitations, labels for the gifts and favours) are prepared. This is also the time, when all the schedules and timelines are created for the wedding. Have your wedding dress and tuxedo fittings. Make sure, you have your shoes, lingerie and accessories. Create a packing list of items which you will take with you to your wedding destination. Create your own bridal emergency kit. 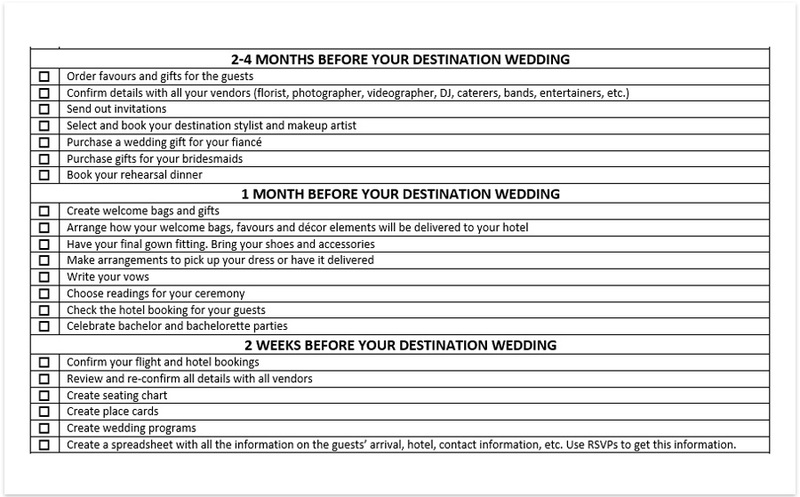 Make sure you have finalized your payments with the vendors 1-2 weeks before the wedding, prepare some cash for the tips. Leaving to your wedding destination, the wedding professionals recommend taking all your valuable items (wedding dress, tuxedo, rings, etc.) in your carry-ons in order not to lose anything. The day before the wedding there is a rehearsal dinner and preparations. Make sure your wedding dress is wrinkle-free, the shoes are comfortable, the accessories are there. The wedding experts recommend having a couple of relaxing treatments (for example, yoga or massage) and getting enough sleep. The next day ? get married and enjoy the beauty of your wedding destination! To simplify your planning a destination wedding checklist is provided by eazyplan.